Since the beginning of the year, I’ve taken up running. Partly this is me being inspired by my ultrarunner friend Kimberly (and her husband, Jay). They run ridiculous distances in the cool months, and bike all year round. Kimberly rode with my on last year’s Route 66 Tour. So I don’t know that I have aspirations to run ultra’s, but I do see the value in cross-training. Running uses different muscles than cycling, and at different intensities. Variety is a good thing. Getting locked into one type of activity can lead to burnout. I’m pretty good about mixing things up and finding interesting challenges, but still, I feel the dreaded “been there, done that” creeping up on me sometimes. My concerns with running were: 1) Would I enjoy it? 2) Would I injure myself? The last time I’d run with any sort of regularity was in middle school track. I remember enjoying the low-key training runs, but not liking the stand-around-and-wait rhythms of the actual track meets. When I advanced to high school, I was recruited for the track team, but opted to play tennis instead. No regrets there; I loved tennis. Around 2010 or so, I tried to restart my running. I invested in actual running shoes, but it didn’t stick. 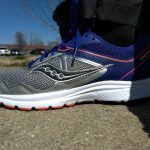 I didn’t enjoy it all that much, and ended up with shin splints, which shut me down and turned me off running entirely. 25.7 miles in January, 28.25 miles in February, and 34 miles in March, for a total of 88 miles. Injury free, other than some mild forefoot bruising. Maximum run distance was 5 miles, but most runs were in the 1-to-3 mile range. I’m still cycling of course, pretty much every day: 973 miles year-to-date. I don’t know that I have any big long-term running goals. It’ll be enough for me to just keep at it. I’ll probably do some 5Ks or 10Ks. I do feel the pull of the ultra scene, but it scares me, for now. Maybe I’ll feel differently after some experience. I bought a Garmin Vivoactive HR smartwatch. My bike computer is a Garmin Edge 510, and all my data is in the Garmin ecosystem, so I wanted to stick with Garmin for running as well. I found a good deal on the Vivoactive HR, so I’m giving that a shot. I hope to be able to do a full review at some point, but for now, I’ll just say that I like it. I wear it all the time, and I appreciate the step tracking and sleep-tracking features. The heart rate monitor is a bit finicky, but it works most of the time. I made do with my old shoes (ASICS GT-2100) for awhile, but I eventually bought some new road running shoes (Saucony Cohesion 10) and some new trail running shoes (New Balance 410v5). With less than 10 miles on each, it’s too early to say much about them. But I found shopping for running shoes to be incredibly confusing. Coming from a beginner’s context, it’s really hard to select shoes, and reviews are not too helpful. Picking the wrong ones can cause injury, and it can get expensive to experiment. Drop? Stack? Neutral vs stability vs control? Pronation? Ride? Minimalist vs maximalist vs traditional? So many specialized and obscure terms, fuzzily defined! In the end, I researched as much as I could, tried on a few, and made the choices. Time will tell, I guess. Hopefully next round I’ll have a better idea of what I need and want. Next up: A way to carry food/water/tech on longer runs. Handheld bottles? Belt? Vest? Hydration pack? Lots of options and price points. I’ve actually found the greatest challenge to be taking it slow. With cycling, I can pretty much ride whatever distance or pace I want, as the mood strikes me. With running, I just can’t do that, yet. Maybe at some point I will. But for now, I’ve had to practice patience. A heart-rate monitor is very useful. It’s fun to see the world from run speed (as opposed to drive speed or bike speed). I’m becoming more appreciative of a well-kept sidewalk network. It’s much easier to go off-piste while running than while cycling. Ditches: just step across. Barriers: just hop over. Road-sidewalk-trail transitions: no problem. Road running vs. trail running: Both are pretty great. I’ve learned that during a run, you don’t have to run all the time. Stopping once in a while, or walking at regular intervals, somehow feels wrong, yet I stop on bike rides for photos or snacks, and that’s totally OK. Weird. Biking somewhere, then running, then biking home, is surprisingly difficult. Not so much physically, but logistically. Carrying the running shoes and clothing, finding someplace to change clothes, storing the bike and gear securely while you run, changing again to ride home. Driving somewhere to run is simpler and less hassle. That makes me sad. I love being a beginner! Everything is new, and I enjoy learning new things. I love the data! Logging of runs is similar to logging of rides, but the data focuses on different things. For such a simple activity, there’s an awful lot of details to analyze. Heart rate, pace, cadence, stride length, etc. Fun stuff for a geek. Strava is, of course, still the best, in my opinion, and works decently for running as well as cycling, but it’s somewhat limited in its analysis potential. Smashrun has a slick interface, with some unique features, but data analysis is marginal (or perhaps hidden behind a paywall). 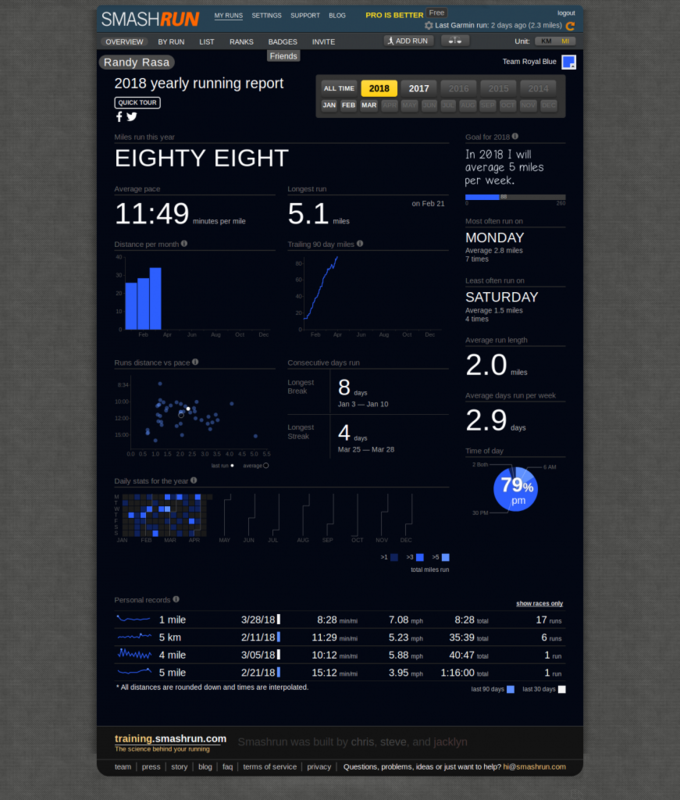 Runalyze is sort of the opposite of Smashrun — lots of data to delve into, but a dense interface. Excellent, and it’s free! Fetch Everyone is a quirky site, but charming as can be. Old-school interface, decent data analysis, but the great thing is that they’ve come up with some clever ways to gamify exercise. My favorite is the “Fetchpoint” game, which is sort of a virtual treasure hunt. This is a very UK-centric site, and there are few US users, which is a shame. Would love to see some friends on there! Other than Strava, there are some other general-purpose activity tracking sites, all of which are just kind of “meh”: Endomondo, Map My Fitness, Movescount, Daily Mile. SportsTracks is pretty good, though not sure if it’s worth paying for. There are some running-specific sites which are all just sort of OK: Runtastic, Runkeeper, Running Bug, RunnerSquare, RunningAhead. This has gotten me thinking … wouldn’t it be kind of cool to create a bicycle tour where you rode from trail system to trail system, stopping at each to camp, and then run/walk the trails?